This magnificent city is the only city in the world which straddles two continents: Asia and Europe. According to recent archaeological discoveries, Istanbul's history goes back to 6500 BC. Istanbul is unique in the world in having been the capital to three —Roman, Byzantine and Ottoman— empires between the 4th and the 20th centuries. Today, Istanbul is a huge cosmopolitan city with a population of 14 million, and is the financial, industrial and cultural capital of Turkey. Serhan guides special interest tours in Istanbul —the city where he has lived for more than two decades. He provides services that run the gamut from historical walking tours to lectures on historic areas and monuments to excursions into the modern districts and crowded urban centers of Istanbul to the various small and charming neighborhoods of greater Istanbul. His tours give travelers valuable insights into the history, art, culture, food, music and all the rich experiences offered by this beautiful city. 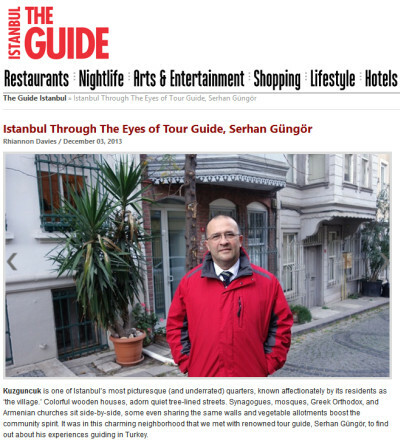 Serhan will be delighted to be your guide to Istanbul. Where in Istanbul magazine asked Serhan to describe his perfect day in Istanbul.